Scandinavia seems relatively close to Germany, yet it is far away by normal travel standards. It may take a day or two to reach the final destination, almost the same time-span as with many more exotic targets around the world. And it is very popular among people, with marked trails, comfortable huts, bridges. On the other side the sheer dimensions of the arctic land provide the ground for long hikes, along with the fact that it is permitted to set up a tent in most places. This makes it possible to plan a route independent from huts. The chance of taking photographs at remote places in the morning or evening hours with their special light more than outweighs the heavier backpacks, which are often subject to strange looks from local people. The Dovrefjell, one of the popular hiking areas in Norway, is famous for its musk oxen, the only place in Europe where to find these ancient animals. We spent a week to walk from Kongsvoll to Bjorli, from station to station, using the train from Oslo to Trondheim. Two national parks cover almost the whole mountain range - Dovrefjell-Sunndalsfjella NP in the northwest, the area we visited, and Dovre NP to the southeast bordering to Rondane. It was an exceptional hot and dry year, making it easier to cross swampy patches. The air was clear, mosquitoes almost nonexistent. The Hardangervidda is a treeless, arctic landscape with no big valleys, hence it is called a plateau. It is protected by the biggest Norwegian national park. The idea in 2009 was to cross the Hardangervidda from south to north, from Haukeliseter to Finse on the Bergensbanen, with attractive points on route such as the Harteigen, the Simadalsfjorden, a waterfall, and last not least the icecap of the Hardangerjokulen. We moved on marked trails, and without the many bridges it wouldn't have been possible to cross the majority of the rivers. In 2015 we came back to the area to explore the eastern part from Ustaoset and the the other side of the Hardanger glacier. 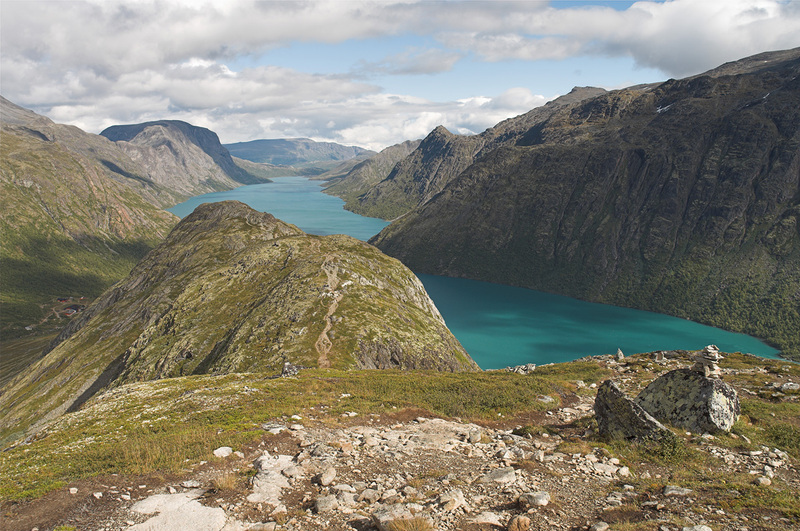 Another popular hiking area is the Jotunheimen. It's character is more alpine with higher mountains, deeper valleys, and a large number of glaciers on the often steep slopes. The mountain range also hosts Norway's highest peaks. A dense net of marked trails exists. Thanks to the many huts it is possible to leave a tent at home, presuming you are rich enough to stand the prices. The area is relatively popular, and places such as the Besseggen are extremely popular and often crowded. Above the arctic circle in northern Sweden wilderness prevails. The Sarek National Park, together with its immediate neighbors, forms the biggest protected area in Europe. Contrary to other national parks in Scandinavia the interior of the park does not have marked trails nor huts, thus requires a tent and a heavy backpack. The weather is colder and more rainy than we had been hoping for, and the resulting rivers have to be crossed without the help of bridges. Many high mountains, combined with high precipitation and the northern latitude, give birth to Sweden's biggest collection of glaciers. Just below the arctic circle, near the Russian border, is what is called the most popular hiking trail of Finland. A well-marked path runs over 80 km along rivers, through valleys, swamps, clouds of mosquitoes. Many campsites and huts fitted with firewood provide a good service, although a tent guarantees full freedom from the crowd, not to mention to get away from mosquitoes at least during the night. A flight via Helsinki to the airport at Kuusamo is the quickest route into the area.